If your little ones are more Skate Brat than crochet and lace, Lennox Head label Pram Rock may be just what you are looking for. Pram Rock is dedicated to providing babies and toddlers with street style with their range of tshirts that are very rock, funk, and break in sizes 00 to 2. I'm quite partial to the Happy Staffy design (of the course the pet of all rock kids), and the God Saved the Gene tee is just too funny. Danielle Parmenter and her husband started the business using their combined graphic design and web design skills along with experience in the surf industry. All t-shirts are screen-printed by hand on the Far North Coast of NSW (just near Byron Bay). You can find Pram Rock t-shirts in the online store. Check out upcoming designs and news on the Pram Rock blog. 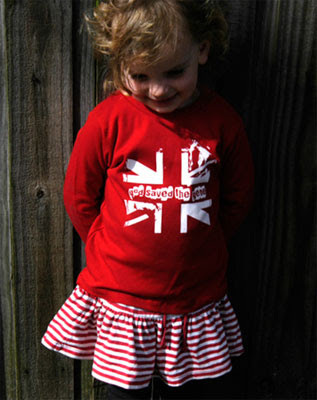 For more great kids clothes, check out Bondville Kids: Australian Designer Baby Clothes. 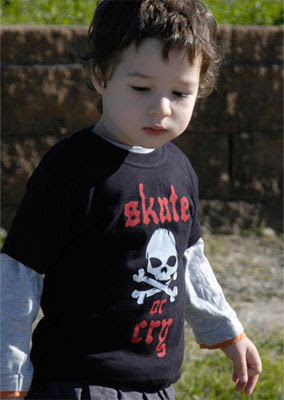 Awww, that skate or cry shirt makes me smile! Very very cute! Thanks for stopping by Down Pillow; I think they're pretty darn cute too.